Are you looking for some fun and creative Teacher Gift Ideas? 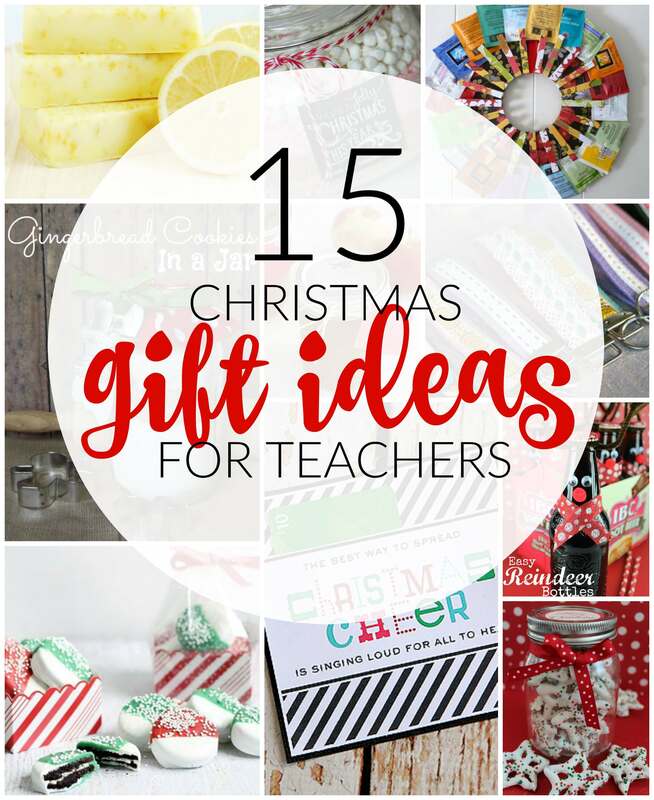 Every year about this time I start searching for easy teacher gift ideas and this year we have pulled together 25 Incredible Teacher Christmas Gift Ideas that you can make yourself without spending a fortune. I love this adorable Christmas Tea Wreath! It’s one of the most creative Ideas I have seen in a long time! You can grab any flavor of Tea or Hot Chocolate and make your own with just a few simple ingredients! Use Glittered Washi Tape to easily Decorate the Clothespins! I have actually made these 2 or 3 different times, these are really inexpensive and so creative! You can get the Key Fobs Here on Amazon, these are only $0.39 each when you order in sets of 50! These look so simple and really cute! You can make your own DIY Hot Chocolate Kits, wrap up with a Ribbon and Cute Note and it’s perfect for Teachers, Co-Workers or Neighbors! Give a DIY Gingerbread Cookie Mix in a Jar with this simple recipe. Include the Directions and a Cute Cookie Cutter Tied around the Jar with a Ribbon! Get this easy Slow Cooker Apple Butter Recipe and make a homemade treat that your teacher will love! You could also include your favorite Biscuit Recipe. Place all the ingredients for Stove Top Potpourri in a Jar and tie up with a Ribbon and Directions for Simmering. You can get the FREE Printable Tags Here. The Best Way to Spread Christmas Cheer is Singing Loud for All To Hear! Download this FREE Printable and include an iTunes Gift Card as a Teacher Gift, this is great if you have a Younger teacher, a male teacher or even a Teenager that your having trouble buying for. You can often get iTunes Gift Cards at a discount. Give this adorable Merry Mistle-Toes Gift Set filled with all the items you need for the Perfect Pedicure along with a Fun Holiday Color! This is a simple treat that your kids can help you make. White chocolate Dipped Oreos are a classic treat + You can dress them up with fun sprinkles or Royal Icing. You can make your own Chocolate Covered Pretzels with just a few simple ingredients. These are great for making for a lot of different people, I also love making these for a party. Download the Free Printable Gift Tags and Purchase a RedBox Movie Online then fill in the Redbox Code with the one you receive in your email. You can also purchase a Dominos Gift Card, include Movie Popcorn or Candy and other Movie Night Themed Treats. You can make your own Homemade Hot Chocolate or use Pre-Made and add in Mini Marshmallows and Crushed Candy Canes for a Peppermint Twist on a Classic! Dress up a 6 pack of Rootbeer with adorable Reindeer Antlers, Red Noses, Eyes and a Scarf! This is such a cute gift idea for teachers and kids alike! Package up several Ice Cream Toppings, an Ice Cream Scoop and your favorite Christmas Movie! You can also include Pop Corn, a Free Redbox Code or anything you can think of. There are some Free Printables on this page you can use to decorate your gift box or basket. You can make your own Homeamde Soap in so many different flavors and scents. You can check out this amazing Homemade Lemon Bar Soap then wrap it up with a festive Box or Ribbon.